August is “Connected Educator” month, which is another way of saying that folks are trying to make visible the power of networks, collaborations and connections that come about when teachers connect with other teachers. Of course, we do this mostly in our own buildings. But more and more, educators are reaching out to various online communities to find ways to share, explore, learn and borrow ideas from one another. I view the month as a way to showcase those kinds of connections, as partnership to the connections we have with our own colleagues in our own school buildings. If you want to learn more about the Connected Educator Month, including various activities, there is a ton of information at the Digital Is website – including a notice about Teachers Teaching Teachers tomorrow night (Wed), when I am joining a bunch of others to talk about this shift in expanding our networking circles with TTT host Paul Allison and others. Where do you make your connections? 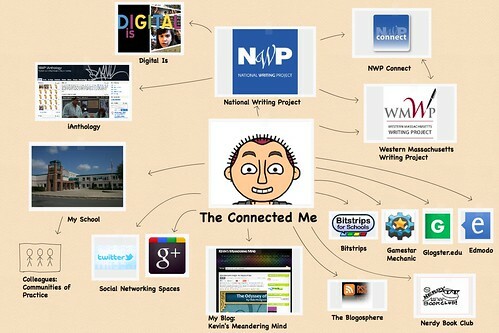 This entry was posted in Connected Educators, nwp. Bookmark the permalink.